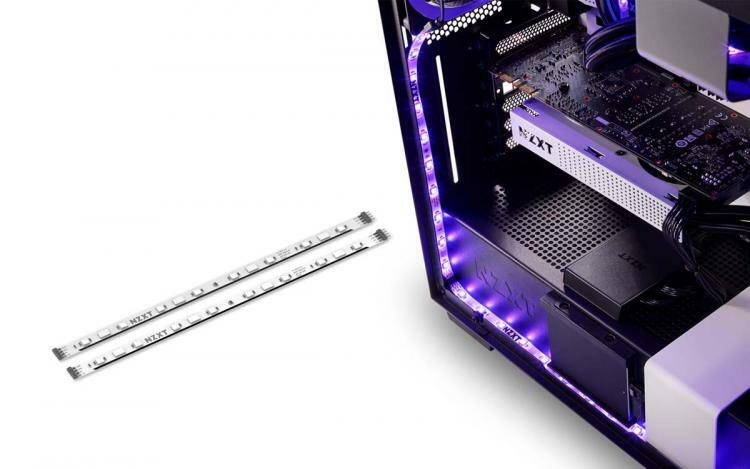 NZXT adds 200mm and 250mm HUE 2 RGB LED strips to be included in NZXT’s HUE 2 RGB family of accessories. The first released HUE 2 RGB LED strip was 300mm in length (model number AH-2SA30-D1) sporting 10 individually addressable RGB LEDs. The AH-2S825-D1 250mm HUE 2 RGB LED strip sports eight addressable RGB LEDs while the AH-2S620-D1 200mm HUE 2 RGB LED strip has six. The addition of the 200mm and 250mm RGB LED strips provides builders options for greater flexibility. Check out our review of the NZXT HUE 2 RGB Lighting Kit here. The NZXT HUE 2 RGB family of accessories has its own built-in microcontroller which sports a patent-pending feature that allows every HUE 2 RGB component to identify specific LED configuration. This allows users to mix and match HUE 2 RGB products and still fully customize each addressable RGB LED on all accessories. Like the 300mm variant, the 200mm and 250mm HUE 2 RGB LED strips are fully compatible with the HUE 2 RGB Lighting Controller and come with a magnet and double-sided tape for easy installation anywhere in your chassis. The 200mm and 250mm variants of the NZXT HUE 2 RGB LED strips are now available at NZXT.com and partner resellers worldwide with an MSRP of $20.99USD and $22.99USD respectively. Learn more about the NZXT HUE 2 RGB LED Strips here.